PHOTO: Allen Ramsey, DWCPhoto.com. 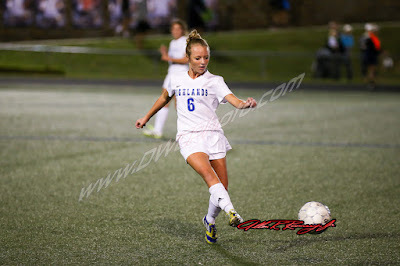 Highlands sophomore Hannah Gish (6) plays the ball ahead in the game against Notre Dame on Tuesday. Highlands won 3-2. The Highlands Ladybirds soccer team (14-1-1 overall) will take any win over the Notre Dame Pandas (11-6-1) because it happened for just the fourth time since 2008 in 16 meetings with the 3-2 thriller at Tower Park on Tuesday. One of the two teams has won a region championship every year since 2003. The Pandas have won the last five region crowns on their way to two state championships. Highlands moved to 9-0 in 9th Region action with the win. But the last thing Highlands wants to do is develop a false sense of security with the win. The Ladybirds know they need to improve before potentially facing the Pandas again in the 9th Region Tournament. "It's hard to learn from a win because you don't have any punishment," said Olivia McQueary, Highlands junior goalkeeper. "But hopefully through practice, we can work on our weaknesses because they were definitely exposed (Tuesday)." Highlands knew it needed to play better against Notre Dame and Newport Central Catholic entering the season if it wants to advance deep into the state tournament. The Ladybirds finished 1-3 against those two rivals last year including the two losses in the postseason. Highlands beat Notre Dame, 3-1 in Park Hills last year before Notre Dame returned the favor with a 1-0 win in the 9th Region semifinals. "Each girl has one major weakness whether it's not using their non-dominant foot so they dribble into pressure or they refuse to use their head to clear a ball, which creates too many 50-50 situations," said Brian Wiefering, Highlands Head Coach. "If they don't get better, that team will beat us three or 4-0. We did enough to win (Tuesday). At our practices from here on out, we're going to be taking girls aside and figure those weaknesses out." Winning the regular season meetings at Tower Park in dramatic fashion with a combined 20 seconds left on the clock started the Ladybirds in the right direction. Eight days after beating NewCath, 1-0 with eight seconds left in the second overtime, Highlands struck gold again with 12 seconds left in regulation. With 25 seconds left in the game and facing a tie, Highlands made a run up-field and Notre Dame knocked it out of bounds along the right sideline. After the throw-in, Highlands senior Sydney Ossege found senior Claudia Hils near the top of the 18-foot-box. Hils deposited it in the upper right part of the goal to give the Ladybirds the win. That marked the fourth goal of the year for Hils and team-high eighth assist for Ossege. "The team has more heart probably than any team I've seen," Wiefering said. "That's where a lot of those goals are coming from. I just hope that they learn from this win as much as they would if we lost or tied. I know you dig deep when you lose. That's all I hope." Highlands played a good part of the game a player up after Notre Dame junior midfielder Mary Tierney received a red card with 17:17 left in the first half. But the Pandas put up a fight outshooting Highlands, 16-12 including 11-10 on goal. McQueary recorded nine saves and Notre Dame goalkeeper Audrey Nienaber had seven. It did not take Notre Dame long to score a goal after that. Following a Highlands penalty just 40 seconds after Tierney's ejection just outside the 18-foot-box to the right of the goal, senior Ellie Vandergriff found Maddie Wilhoite in the middle for the score. "I hate it because I think the team 11 takes its foot off the petal," Wiefering said. "I think that the team with 10 plays a little harder. What Notre Dame did is play a little more direct because they had 10. They have forwards. Our backs as great as they are have not gone up against that type of pressure. Our backs have to get better." But that marked the only Panda lead of the game. Hils played the ball ahead to Lindsey Meyer to tie the game with 8:10 left in the half. That marked the eighth goal of the year for Meyer and the second assist for Hils. The last three goals occurred in the final eight minutes of the game. Freshman Maria Wiefering took a pass from fellow freshman Lauren Deckert for her sixth goal of the year with 7:36 left in the game to put Highlands up 2-1. That marked Deckert's second assist of the season. But Notre Dame tied the game at 2-2 with 5:27 left in the game with its vaunted up-hill transition attack that Highlands limited in this game. Wilhoite found Ellie Hellmann in the attacking box. Notre Dame saw 14 different players score entering the game. Senior forward Christin Sherrard led the way with 12 goals and senior forward Sidney Spivey had 10. "We know (Notre Dame) is fast because we've played them before and they're very physical," said Hannah Gish, Highlands sophomore defender. "But we just had to pack it in and the defense had to get back and cover in the center-mid so no one could get past and take a shot." Highlands recorded 16 fouls to 12 for Notre Dame. Highlands had two yellow cards to one for the Pandas. Highlands takes on Dayton at Tower Park on Thursday to finish off 36th District play. Game time is 6:45 p.m. I understand this article covering Highlands, but how come there is literally no news coverage on NCC? Both boys and girls soccer participated in the All A State tournament and not a peep from FTM? It would be nice to have more overall coverage considering you covered Crave closing in downtown and that's not even in Northern KY.
Hey! Feel free to give us a shout over on our Facebook page or Twitter to let us know what's going on with NCC. We only have one sports guy and he's spread pretty thin. General reporters have an opportunity to cover things like Crave closing. Sounds good. More than happy to share with you news about NCC, etc. It can be tough with only one sports reporter. Completely understandable.